Poet and essayist Linda Russo will read selections from her work Thursday, April 21, at 6 p.m. at Night Heron Books, located at 107 E. Ivinson Ave. in Laramie. A question-and-answer session and book signing will follow the reading. The University of Wyoming Creative Writing Program sponsors the event, which is free and open to the public. Russo has written three books of poetry and a collection of literary-geographical essays. Her reading will celebrate the release of her new book of poetry, titled “Participant.” The collection won the Bessmilr Brigham Poets Prize. 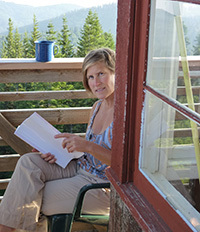 Russo teaches courses in creative writing and literature at Washington State University. She received her Ph.D. in English from the Poetics Program at the University at Buffalo and her MFA from Emerson College. For more information about the event, email the Creative Writing Program at cw@uwyo.edu.